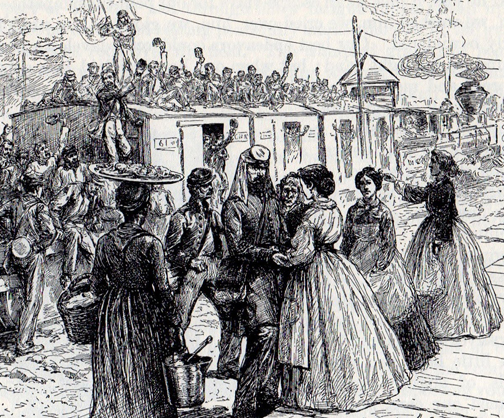 During the spring and early summer of 1861, Confederate recruits gathered in Prince William County, Virginia, at the crossing of two railroads, the Manassas Gap and the Orange & Alexandria. By July 20,000 Southerners were waiting for the first great battle of the Civil War as 35,000 troops in the Union Army left Washington City to march to Richmond, now the Confederate capitol. "On the Way to Manassas"
Union General Irvin McDowell's first goal was to capture the railroad crossing that led to Richmond. Excited Washingtonians followed the federal army, carrying picnic baskets for a summer outing while they watched Union troops vanquish the Rebels and put short end to the war. Newspaper correspondent "G.P.R." wrote an article for the Boston Transcript describing the "advance of General McDowell's vast column of troops towards the 'land o' Dixie' ", on July 16th. "The sun shone brilliantly, and the fresh morning air was highly invigorating. The troops on foot started off as joyfully as if they were bound upon a New England picnic, or a clambake; and not the slightest exhibition of fear or uneasiness, even, as to what might possibly be in store for the brave fellows, (thus really setting out upon an expedition from which, in all human probability, hundreds of them will never return!) seemed for an instant to occupy any part of their thoughts for their anticipations. Our troops entered Fairfax—ten thousand of them—at early noon, the bands ringing out with cheerful tones the "Star-Spangled Banner," and the boys cheering lustily for the Union and the Stars and Stripes. Six or seven thousand infantry blocked up the main street, for a time; the Court House building was taken ... a secession flag was hauled down and the banner of the regiment run up in its place, and then the foot soldiers opened right and left, or gave way, for the entrance of the cavalry and artillery. These dashed through the town at a gallop, and down the road out into the country beyond..."
On July 18th they met General Pierre Beauregard's army at a creek named Bull Run about 25 miles from Washington. Over the next few days rebel troops, backed up by 10,000 reinforcements, held their ground . The novice Federal soldiers fled in chaos, running panicked spectators off the roads back to the Union capitol. 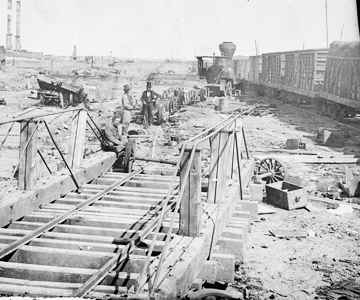 Manassas Junction was the site of a second battle in 1862. This photo shows tracks destroyed by the retreating Confederate Army. Over 400 Union troops were killed and nearly that many Confederates. With this Confederate victory North and South were jolted into a realization that this was not to be a thirty-day war. On July 22nd President Lincoln asked for 500,000 men to sign up for a three-year enlistment. Railroad Crossing can remember the War's first battle, called by the Confederacy "The Battle of Manassas" (First Manassas) and by the Union "The Battle of Bull Run." 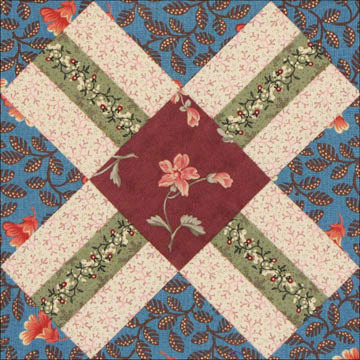 The patchwork pattern Railroad Crossing (BlockBase #2779) was given that name in 1935 in the Kansas City Star's quilt column. A Cut 2 dark squares 2-7/8". Cut each in half diagonally. You need 4 dark triangles. 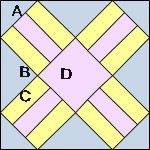 B Cut 1 dark square 5-1/4". 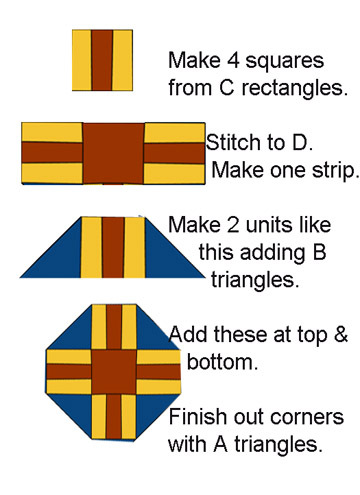 Cut into 4 triangles with 2 cuts. You need 4 dark triangles. C Cut 8 light and 4 medium rectangles 1-1/2" x 3-3/8". D Cut 1 medium square 3-1/2". I love this block - but as a Civil War history buff, I always love the history. Thank you for having such a unique and interesting blog. Thank you again for another interesting post and wonderful block. One day I may use your inspiration to make a quilt but in the mean time I love reading the history. When doing some FH on my husbands side I got back to his GGfather who faught in the Civil War ...I found it fascinating to read up on the background being from over the pond. Very nice post. I have completed my block and posted it on my blog along with a how-to. Here is where I posted my block and how-to. how do I copy the directions? Thank You found cutting directions/copy-able on your site only... Love the insert of the photo... My father and grandfather nearly 100 years later were owners of Excavating and R/R Construction Company... clearing up cars,debrie and repairing tracks after wrecks !